I have already remarked on the distribution of the pre-convention journal. (See “Convention Journals.”) I do not know how most deputies dealt with the failure of the diocese to distribute paper copies of convention materials. I suspect that some people brought an electronic copy of the pre-convention journal with them. Others likely brought complete journals printed on their slow and expensive home printers. No doubt, some deputies printed only selected pages or none at all. The distribution of the pre-convention journal should be rethought for 2014. I arrived at Trinity Cathedral about three o’clock Friday to begin putting the PEP table together. I was met by PEP president Mary Roehrich, who brought candy and the decorative items for the table. I was distressed to learn that there were either no assigned tables or, if there were table assignments, no one knew what they were. Exhibitors found themselves involved in the convention equivalent of the Oklahoma land rush. PEP was fortunate in snagging a conspicuous location that enjoyed a good deal of traffic. Organizations that found tables along the walls of the cathedral lunch room were less fortunate, as movement in front of their tables was inhibited by small clearances and people talking to one another between the exhibits and the tables set up for conversation and eating. That said, the arrangement seemed better than having displays in the church itself, an arrangement used in recent years. The agenda of this year’s convention was curious. Unlike previous years, there was no business transacted on Friday. A major result of this was that many clergy and lay deputies stayed away. For those who did come, there was no registration and, therefore, no name tags. (Exhibitors did get name tags Friday, however.) Essentially, Friday was purely social. Of course, it was less social than it might have been, since so many people stayed away. A pleasant meal was served, courtesy of Trinity School for Ministry. The caterers were late in arriving, however, so less time than planned could be devoted to eating. This turned out not to be much of a problem, and the convention Eucharist began only slightly later than planned. It was All Saints’ Day, and the service began in the church graveyard, which was a nice touch. After the service, we adjourned to the Green Room (or was it the Blue Room?) for desserts and entertainment. The desserts were tasty, but the room was really too small and would have been horribly inadequate had more people showed up. Entertainment was supplied by Zach Simons—Jim Simons’ son, we were reminded repeatedly—and an improv troupe. As might be expected, the quality of the performance was variable, but it did have some funny moments. The program concluded with a skit with Zach and “Special Guest Star,” who, to no one’s surprise, turned out to be Bishop McConnell. The bishop portrayed Charles Wesley. Saturday was most notable for its unforgiving schedule. The lack of significant breaks discouraged socializing and strolling past the exhibits. Not even lunch provided a break, as lunch was a working lunch devoted to district meetings. Things proceeded more or less on schedule. A more comfortable schedule would have moved at least some business to Friday, freeing up time on Saturday. I’m sure that many attendees of the convention would join me in arguing for a 2014 convention held somewhere other than downtown. The problems of holding a convention at Trinity Cathedral begin with the parking. Over the two days, I spent nearly $20 in parking fees and spent an uncomfortable amount of time double-parked loading and unloading passengers and table paraphernalia. As I suggested above, there was too little room around most of the displays and too little room where the Friday entertainment was staged. The worst feature of using the cathedral, however, is its sound system. I don’t know why the sound system in the church is so terrible, but it is. People in the back of the room could hardly hear anything. People in the front pews could hear only slightly better. Although the problem seemed widely recognized, speakers seemed disinclined to try projecting more. When various measures were being discussed, there were no microphones for deputies speaking from the floor, and the bishop did not think to repeat the questions or remarks before responding to them. No doubt, some deputies tuned out during these interchanges. There is, I suppose, some symbolic value in staging our conventions at Trinity Cathedral, particularly in light of its recent history as both an “Anglican” and Episcopal church. Surely, however, there are more serviceable venues available in the diocese. Until we Episcopalians recover St. Stephen’s, Sewickley, perhaps the best place for a convention would be St. David’s, Peters Township. The 2002 convention was held there, and, although there are bad memories of that convention, at least the church has more than ample parking. The centerpiece of the PEP table at the convention was a slide presentation about what PEP does and where it came from. A lot of effort went into the slide show, which began as a wordy 16-page presentation and ended as a lean 11-page show. 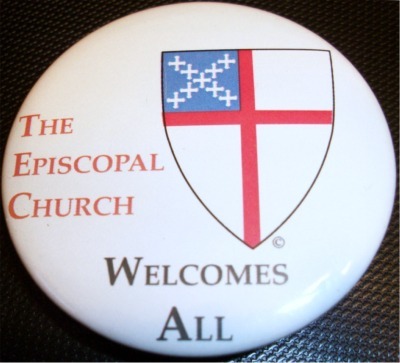 “Progressive Episcopalians of Pittsburgh: Entering Our Second Decade Supporting The Episcopal Church” provides a quick introduction to PEP and can be viewed on YouTube. Paper copies of the slide show were also available at the PEP table. The other new document developed for the convention was an introduction to PEP titled “What You Should Know about PEP,” which is available on the Web here. The table also included copies of the PEP membership form. The PEP table was rounded out with several bowls of candy (very popular), flowers (very pretty) and a basket of buttons with the legend “The Episcopal Church Welcomes All.” (See photo at left) PEP first had these buttons made for a convention a few years before the 2008 diocesan split. We had a hard time distributing them until after the split. (We gave out many buttons at the special convention of December 2008.) I am happy to report that many people picked up a button at the 2013 convention, and our supply has now been exhausted. We may want to design a button for next year’s convention. Do any readers have suggestions for a new button design? Update, 11/8/2013. I am told that the entertainment was in the Blue Room, not the Green Room, on the second floor of the cathedral. Also, Part 2 of my reflections on the annual convention can be found here. Thanks, Lionel. Since caring for the Church, both local and in the wider frame, is my "day job," I always found the old schedule, noon Friday to noon Saturday, very convenient. That schedule did make it harder to recruit lay deputies with other kinds of day jobs, though, since it required at least a half a day, and most often more, of vacation or personal time off. I think even the late afternoon start of business, as we've tried a few times, raised the same issues. In terms of Friday evenings, I also much preferred a convention banquet and keynote speaker to the recent focus on entertainment--no matter how enjoyable that entertainment might be on its own terms. I agree that it was especially too bad that so many clergy, deputies, and guests will have missed our bishop's excellent sermon at the Friday Convention Eucharist. And I would also just note that while PEP and I have had our differences over the years, there was no question this year that your table had the best candy . . . . I stand by my complaint about the lack of table assignments. Why wasn’t there a copy of the exhibit layout at the cathedral this year? That was not rocket science. The agenda called for “light supper” at 5:30. Food was not available until just after 6:00. People who were setting up tables had to arrive before 4:00, so I paid $12 on Friday. On Saturday, I packed up the PEP materials but did not leave immediately, so I had to pay for two periods of parking.